End a scroll view begun with a call to BeginScrollView. 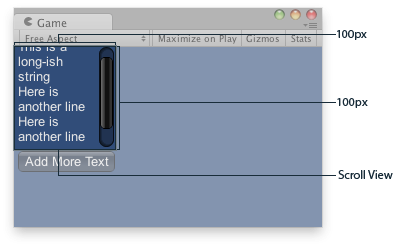 Scroll View in the Game View..
// The variable to control where the scrollview 'looks' into its child elements. // The string to display inside the scrollview. 2 buttons below add & clear this string. // it will use up any available screen space and make sure contents flow correctly. // This is kept small with the last two parameters to force scrollbars to appear. // scrollbars will work correctly with wordwrap. // End the scrollview we began above.